The new TownPlace Suites on Eastern Avenue opened up March 6, but this week already saw two sellout nights at the new 140-room hotel. 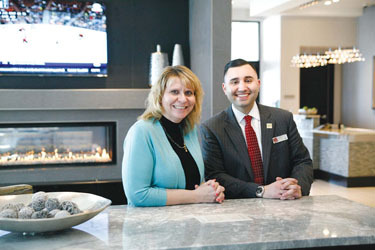 Here, Julie Scott, senior VP of sales and revenue management, and Joe Fiorello, sales manager, show off the impressive lounge at the new hotel. If the brand new TownPlace Suites on and the two-year old Residence Inn were somehow people, one would quickly make the assumption they were closely related. 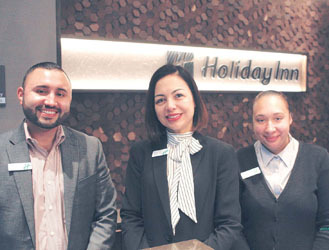 The newest hotel in Chelsea – and the first one on the eastern side of the city – opened on March 6 by Colwen Hotels and, while they are distinct, they have a similar luxury feel. Walking into the lobby from busy Eastern Avenue, one is quickly immersed by large windows with lots of natural light, while a double sided fireplace warms the area where chairs and a business center are perched. On the other side is a smartly outfitted, granite-filled lounge and bar where guests can get a drink, have something light to eat, get busy on work and catch up on the day’s news or sports via large screen televisions. A uniquely designed breakfast station with several tables in a circular alcove overlooking the Chelsea Street Bridge also highlight the entry space. Such highlights have already drawn tons of visitors to the new hotel, said Sales Manager Joe Fiorello. Julie Scott, a marketing representative with Colwen, said the TownPlace is the closest Marriott to the Airport – being just 1.3 miles from Logan and only a quick trip into Boston. Fiorello said there are 128 Studio King Suites and 12 one-bedroom suites. The facility serves extended stay customers and nightly customers too. There is a heated, saltwater pool and a fitness center as well. Each room is outfitted with a kitchen facility as well and there is also plenty of free parking, which is another advantage of the Chelsea location. “That’s a really big thing in Boston,” Scott said. “To have free parking is really desirable. On Monday morning, taking advantage of the lobby was Alyssa Johantgen, who was staying with her husband in the TownPlace. The couple is from Minnesota and they chose to make a mini-vacation out of his business trip to Boston. Right now, the hotel is getting a lot of overflow business from the airport as well, but both Scott and Fiorello said they expect more guests such as the Johantgens when the new Silver Line project debuts next door at the MassPort Parking Garage. That public transportation connection will give guests a one-seat ride to the Seaport District, the South Boston Convention Center and South Station.